Appau Junior Boakye-Yiadom, P.Y.T., 2009. 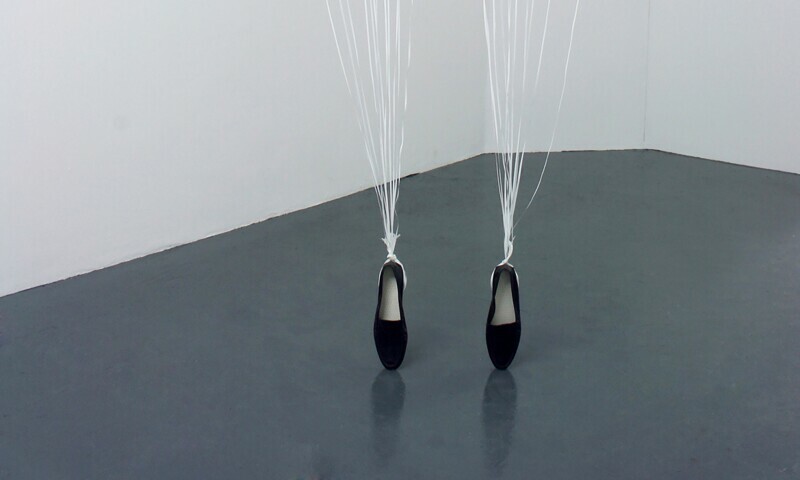 Latex balloons, ribbon and penny loafer shoes. Dimensions vary. Michael Jackson is one of the most influential cultural figures of the 20th century and his legacy continues to 21st century. Although he has always been considered as a reference in the world of music, video clips, dance and fashion, his impact on contemporary art has never been discussed and never made the subject of an international exhibition like this one. Nearly ten years after his death, the legacy of Michael Jackson is more alive than ever: his record sales, which now exceed one billion copies, continue to increase, his videos are still watched, and his many fans him remain faithful. His influence and fame do not falter, and the issues he has raised as a social phenomenon, especially from the point of view of identity, race and celebrity, are still relevant today. In addition to breaking all record sales records, winning numerous awards, participating in a multitude of philanthropic actions, and breaking down many cultural barriers, Michael Jackson is also one of the most represented personalities in the visual arts. Since Andy Warhol used his image in 1982, a wide range of contemporary artists, from different generations and working in different countries, have done the same. For the first time, the Michael Jackson: On the Wall exhibition brings together the works of more than 40 of these artists, works from public and private collections around the world, and includes new works created especially for the occasion.